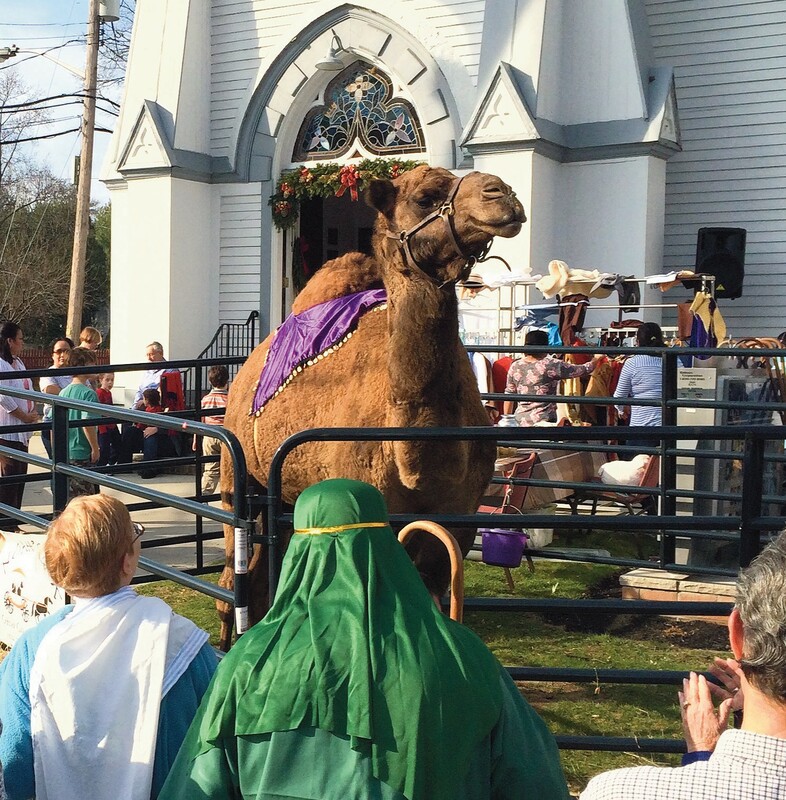 A 1,200-pound camel named Joseph attracted the attention of visitors to a living Nativity scene at the First Baptist Church of Freehold on Dec. 13. A donkey, sheep and goats were also participants in the holiday event. FREEHOLD — A live camel on the streets of Freehold Borough caught the attention of many residents and visitors to town on Dec. 13. The camel, a donkey, sheep and goats were participants in the First Baptist Church of Freehold’s living Nativity scene at 81 W. Main St.
Joseph, a 5-year-old camel, and the other animals were provided by Noah’s Ark Critter Care of Millstone Township. “This is the first year the First Baptist Church has done the live Nativity,” the Rev. Teresa Ely said. The living manger was held on the front lawn of the church and attracted about 200 participants, according to church member Jean Buscaglia-Yurkiewicz, who coordinated the event. Church members and people passing by were able to take part in the living Nativity by dressing in biblical costumes, several of which were handmade by Buscaglia- Yurkiewicz and her mother, and posing for photos with the animals. Participants were able to dress up as Mary, Joseph, shepherds and the wise men. “One of the most recognizable symbols of the season is the Nativity scene. People have them in their yard and in their home. This was a way for people to actually be a part of that scene. It is a way to help everyone remember the reason for the season,” Ely said. The Nativity, Ely said, “brought all kinds of people together who shared in the joy of the Christmas season. As a church family we are looking for ways to connect with the community around us. “Some of those ways are practical, like collecting food for the local food pantry. Other ways are about making face-to-face connections with our community. “Joseph the camel was wonderful. The variety of reactions from children was wonder, uncertainty, delight — there was so much laughter,” the reverend said. The church will make this an annual event, Buscaglia-Yurkiewicz said. Kim Mooney of Noah’s Ark Critter Care said Joseph took the ride from Millstone Township to Freehold Borough in a horse trailer. The 7-foot-tall, 1,200-pound camel requires three handlers.